This is an article I originally wrote for Living Intown magazine, January, 2016. It was later featured on ajc.com. As you walk into furniture-maker Kendrick Anderson’s studio in Castleberry Hills, among the industrial sanders and table saws you’ll notice a simple, handmade cabinet containing an antique handsaws, planes, drills and files — some dating as far back as 1911. This functional shrine to traditional woodworking reflects Anderson’s love of the craft. This story originally appeared in the January 2016 issue ofLiving Intown magazine. Anderson’s dedication to the basics in building furniture has attracted some impressive clients since he began in 2011. His portfolio includes custom home and office pieces for Octane Coffee CEO Tony Riffel, celebrity chef Hugh Acheson, and MailChimp co-founders Ben Chestnut and Dan Kurzius. He recently built the dining tables, wall sconces and chef’s table for Staplehouse in Old Fourth Ward. For six months, Anderson apprenticed at a shop at the Marietta Artisan Resource Center, where he met his mentor, Benjie Osborne. “He opened up this world of studio art furniture making where you are pursuing this furniture as craft, not just creating functional objects,” he says. 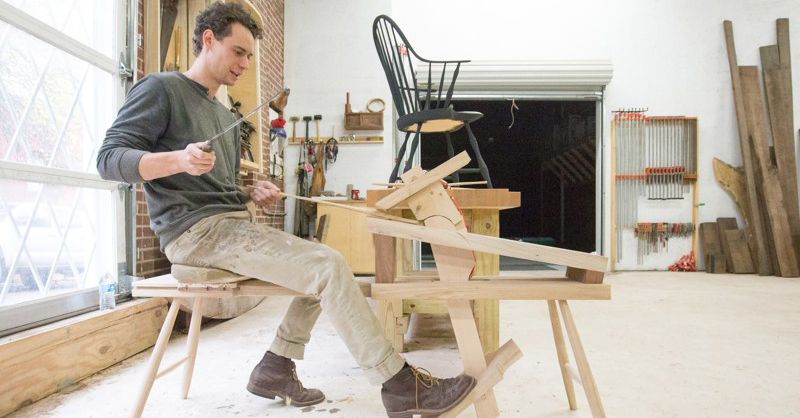 Osborn encouraged him to pursue his passion, and after completing his bachelor’s degree at Georgia State, he continued his training at the Center for Furniture Craftsmanship in Rockport, Maine. Anderson finds influence in Danish modern and midcentury modern furniture, two minimalist styles that emphasize clean, simple lines and functional requirements of the human body. “I want them to be quiet and understated,” he says of his pieces. “I don’t want them to be loud or have too much fancy stuff going on.” Anderson translates this love of elegant simplicity into every table, desk, credenza, bed and other custom pieces he creates for his clients. Anderson, 31, says he feels that he has yet to find his “voice,” and attributes his lack of an artistic signature to his approach to design. He sees each piece as a collaboration between himself and his clients. “My goal is to create the most beautiful, functional piece for that client that will stand the test of time and be passed down to future generations,” he says. He hopes the 7,500-square-foot space will be a home for creatives in Castleberry Hill. “I want this place to be open to a community and a haven for elevating craft in Atlanta,” he says. The studio doesn’t have a name yet, but the Andersons already have tenants, with more moving in soon.